Generoso and Lily’s Bovine Ska and Rocksteady: Sir Mike The Musical Dragon Label 6-21-16 – LILY & GENEROSO 4EVER! First off, we just want to thank everyone who gave us love for last week’s 20th Anniversary episode of the Bovine Ska. It was a tough show to glue together so we are so happy that you all loved it so much. Here’s to another twenty years! The June 21st edition of The Bovine Ska and Rocksteady began with a seldom heard rocksteady cut from Lee Scratch Perry called, Run For Cover, which was released on Star in 1967. We played that in tribute to the endlessly entertaining, live painting event that Scratch put on at Dem Passwords in Chinatown here in Los Angeles on Thursday, June 16, 2016. We followed with seven more smooth rocksteady cuts including Dion Cameron and The Three Tops gem, Miserable Day, which they cut for WIRL in 1967. From the early soundsystem era, we always hear about Lloyd Daley’s Matador, Duke Reid’s Trojan, Coxsone’s Downbeat, Prince Buster’s Voice of the People, and Vincent and George Edwards (collectively known as King Edwards) The Giant sound systems. Mike Shadeed’s Sir Mike the Musical Dragon Sound System stood in the company of these big names, but we often do not hear of Shadeed’s work. Sir Mike the Musical Dragon was considered one of the big six sound systems in Jamaica, so much so that Shadeed was invited by the Jamaican government to partake in Independence celebrations and dances in the mid-60s. As a testament to the reputation and popularity of the Sir Mike sound system, King Tubby, in interviews, has even discussed the power of Sir Mike’s, saying that Sir Mike was even stronger than Coxsone Dodd’s Downbeat and Duke Reid’s The Trojan by the time the mid-60s arrived. Sir Mike the Musical Dragon also introduced the music world to Prince Far I, who was a DJ for the sound system before he became a recording artist. As a record label, Sir Mike the Musical Dragon gave us some excellent ska from some of the best artists at the time. 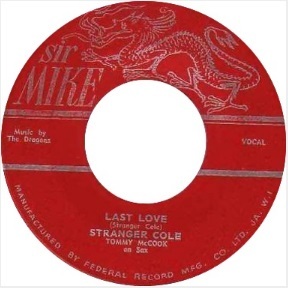 We kicked off this spotlight on the Sir Mike label with a duo of great talent, Stranger & Ken, Stranger Cole and Ken Boothe, who recorded, Hush Baby, for Mike Shadeed in 1963. Before playing melodica in the 1970s, Joe White recorded primarily as a vocalist in the 1960s. For the Sir Mike the Musical Dragon label, White recorded two beautiful skas. Wanna Go Home, features a simple and gorgeous trumpet line from Baba Brooks playing in tandem with White’s solid voice, and “When You Are Wrong” also features Baba Brooks, but White’s voice shines in the track. We started off the second set of the spotlight with both of these wonderful Joe White recordings.